Behold: the easiest software to store your Notes organized on your PC. Hey! Not only! It's the best tool for everyday use - diary, project-management, scheduler, address-management, storing access codes, and so much more! Our aim: no hassle features and simple, elegant interface. Focus on writing your notes rather than seeking help files. 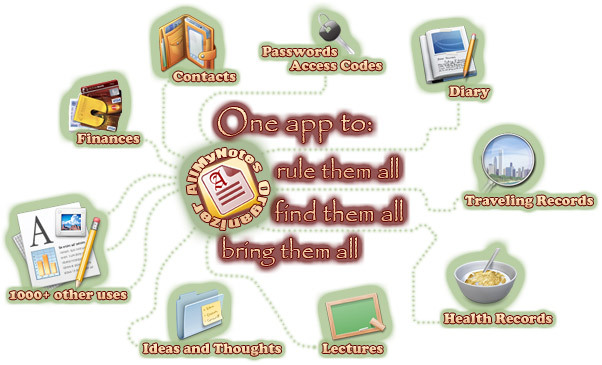 Your important diaries are protected from everyone - simply provide a password for your information, and All My Notes Organizer will lock it by the 1800-bit cipher. Instant search. Hypersonic db-driven storage technology. Export to RTF, HTML, and plain text. Localized to many languages, Themed UI. The idea is not to create a narrowly used tool, rather a smart Swiss Knife, we provide you with "bricks", and out of them you may build whatever you like. Major "bricks" are: access restriction with a password, Alarms, Checkboxes, Tables, File-Attachments, Icons, Strong password-generator, automatic url/email/phone hyperlinking, a Hierarchical organization of notes (by topic), Sorting, blazing fast Search across all your information. Windows XP and newer - 10/8/7/Vista/XP, compatible with both 32-bit and 64-bit systems.